The systems design and implementation using Wwise and Unity. 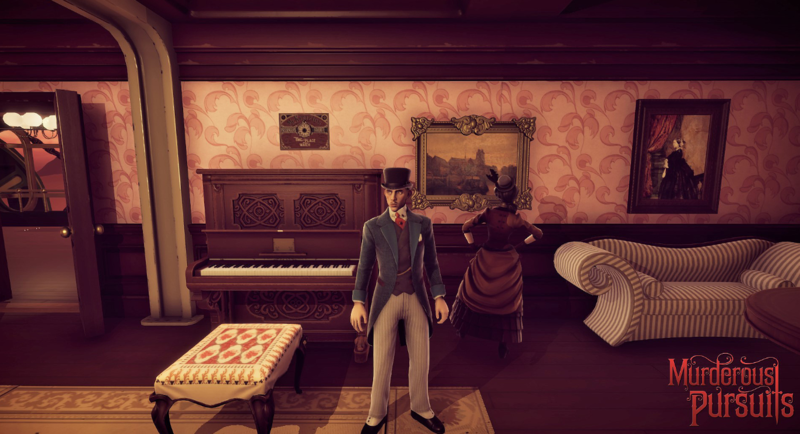 If you haven’t played or seen it yet, Murderous Pursuits is a kill-or-be-killed Victorian stealth-em-up for 1-8 players in which you must hunt and kill your quarry before your hunters do the same to you, all while avoiding witnesses. You can buy it on Steam right now! We use Vignettes to bring more life to the world as well as serving a gameplay purpose. When people group together we want them to strike up conversations, make the levels feel (and sound!) busier, and pepper in a little world and character building to boot. The characters also have different talking animations based around three states: positive, negative and neutral, and incidental reactions such as nodding or disagreeing, to stop things looking and sounding too samey. Basically, we wanted to emulate actual group conversation. You’re probably reading that and thinking “That sounds like a lot of VO needed there” and you’re not wrong, especially if we were looking to avoid the dreaded looping dialogue lines! This would reduce the writing required for conversation vignettes down to about 200 words/phrases per character as opposed to… a lot more, and pushed towards a more technical solution – setting up a playback system that can string random lines of Simlish together will occasionally throwing a word in. That is, of course, after we worked out how we wanted the Simlish to sound. Simlish, for those who are unaware, is the language used in The Sims series of games. It was designed to be as universal as possible to provide a degree of context to what a player’s Sims were saying, while also acting as a practical solution to VO repetition and localisation. Currently it has an alphabet, rough but expansive phrase book, and even real world pop songs translated into the language. You can read a bit more here. Planet Coaster also has a similar solution with Planco, their own in-world language. However, that was designed to be a working, functional language and even has its own official dictionary. You can read more about the design process of it here. Unfortunately, we had neither the time nor the budget to do something quite as detailed, so we opted for a slimmer solution: having our actors voice different lengths of Simlish in each of the 3 tones. We also grouped these requirements into 4 lengths: Short, Medium, Long and Questions. Even within these sets, we have some variation in the length of the phrases for each character to help establish their quirks. For example: The Brute’s short phrases are around 1 to 2 seconds, and his longer ones around the 8 second mark. He’s a pretty to-the-point kinda guy. The Admiral, on the other hand, has shorter phrases around the 3 to 5 second mark and his longer ones reaching up to and beyond 20 seconds in length, reflecting his more blowhard, longwinded nature. We also had to consider conversation flow and the fact that any word or phrase, Simlish or otherwise, could potentially tie into another. Sounds about right! In terms of scope, each character archetype has roughly 600 individual VO clips in game, which is about 4800 files. When we add in Mr. X and the guards that comes to around 5100, which was trimmed down from over 12,000 takes in total. This covers everything from Simglish, spoken words and phrases like reactions, grunts like attacking and dying, and a whole other variety of weird requests that never made it into the game. As far as clean up went, I used Izotope’s RX suite to remove some of the pops and crackles that occur when people speak, like when your lips smack or open. You don’t really notice them in real life conversation, but in a quiet space close to a mic they can stand out and sound unnatural. After that, I used a gate and volume automation to cut out some of the background noises and control the tail offs of words during longer takes, and some De-essing to control plosive sounds (like… “ess”es). There was also some compression and EQ to even things out too. One handy tip that I’ve seen a few other dialogue editors share is to record a few extra takes and pronunciations of certain troublesome letters and word endings that are plosives or stops (like, ess’s, t’s and f’s to name a few) in case you need to do some further edits and repairs. While I didn’t do this at the time around, there was enough content recorded that I was able to stitch together takes that would have been otherwise un-usable, and stretch out the number of variations we have even further. Below is a quick example, where a rogue “th” got a little lost post-processing, so instead of trying to automate volume and EQs I grabbed a clean one from another take before the processing was applied and dropped it in. It might look a bit odd to have a mono clip in between two stereo ones. Ableton froze the tracks to stereo despite the original source being mono, and everything was summed to mono afterwards, so no weird spatial stuff going on in the end! This was originally posted in two parts on the Blazing Griffin Website. Jaime Cross is the sound designer at Blazing Griffin Games in Scotland. A graduate of the University of Abertay Dundee, he has been working in game audio since 2011 and co-founded Dundee based games company Team Junkfish in 2013 before taking up his current role in 2017. He also serves on the board of IGDA Scotland, and is an advocate for the advancement and development of audio in games.